Our host, Sharon Tewksbury-Bloom is on the other side of the microphone this week as the guest, while Gina Byars steps into the interviewer chair. 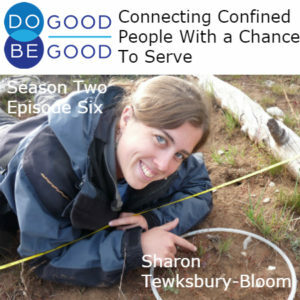 Hear about Sharon’s view on why she serves and why she started this podcast as well as a story from her own term with AmeriCorps. The story is about how Sharon connected a Juvenile Detention program with Meals on Wheels to have youth in detention create valentines for homebound seniors. ANNOUNCER: This is Do Good, Be Good, the show about healthy people and the challenges they face in trying to do good. Your host is Sharon Tewksbury-Bloom, a career do gooder who also loves craft beer and a good hard tackle in rugby. Sharon speaks to everyday people about why they do good and what it means to be good. Gina: Hi, this is Gina Marie Byers. I am this week’s guest host for Do Good, Be Good. Today I am interviewing Sharon because she served with AmeriCorps for a while and we would like to hear her stories. So something that I’ve always found interesting about you is your dedication to participating in the community and I’m curious as to where that started. Sharon: Well I will say that I’ve always been an over committer. I was thinking about that because this January I’ve recognized that I’ve had over committed myself again. Not that I remember really not over committed, but it was just kind of hitting me that I had 12 big volunteer commitments that I had said yes to at the start of this year and so I actually made one of my goals to minimize those commitments. And I thought, wow I’m now needing to regulate myself in the way that when I think I was maybe in 7th grade or around that age, my parents sat me down and said, “you need to cut some stuff out. You have too many commitments, you have too many things you’re involved with. We need to pair this down.” So we had to make a list of all the things I was involved with and then weigh the pros and cons of each and try to figure out what I could cut out of my life. My poor parents, I mean they had two children, and they had to drive us all around and take us to all these things. I wasn’t yet driving and my commitments were their commitments in a lot of ways. And yeah I remember that being a tough choice because I did things like Girl Scouts and 4-H and dance and swimming and I don’t really remember what else but there are just a few other commitments. So I don’t know how much — I mean I see being engaged in a community is also just being an active person who has lots of interests and gets to do lots of things and is always involved in different things. So that has definitely been a cornerstone of my life from very, very early and part of that is a product of being a child born in the 80’s in suburbia who had parents who wanted to raise me in what was seeming like the right way at the time, which was to be very involved and to have all the classes and be in all the troops and all the organized activities. And I went full bore into that. Gina: And so if you are able to talk to that 7th grade self of yours, what would you tell that 7th grader about commitments and participating and doing stuff? Sharon: Well I’d say do it now because it’s gonna get harder as you get older and I don’t regret the things that I was involved with back then. I think I was really lucky. I had a lot of great opportunities and I love the variety of things too, to be able to do both sports and dance and scouts and the whole range. I remember — and I actually don’t remember if I’ve made this up in my mind or if this really happened, but I feel like it happened or maybe I dreamed it was going to happen because of how much I was doing, but I was in soccer and ballet at the same time. And I actually remember going straight from soccer practice to ballet and I hadn’t had time to change so I remember doing plies with my shin guards on and my soccer socks which doesn’t make any sense and I think it probably didn’t really happen and I think I just dreamed that it was going to happen because I was doing so many activities. Gina: That would actually be a really awesome choreographed piece though I think. Have the soccer uniform for the ballet recital costume. Sharon: Yeah, and I don’t think this was all just being a child of the 80’s with parents that were wonderfully indulgent in that way but I think– because I know with my sister being more introverted and having activity she liked to do that were more by herself. She did some activities, but she wasn’t nearly as overly engaged and out there in the community doing all the things as I was. Gina: What is the emotional– when you think back to that time with emotional connection and does it evoke a sense of something that you’d say oh, here’s that heart connection to participating in community and volunteering formally or informally that you can relate back to and– because this is something you’re truly passionate about. And so I’m curious on what the formative do gooding of Sharon is, what was the heart connection when you think back to it? Sharon: Yeah, I think for me maybe different than many people. I always see volunteerism as a way to do something fun and cool with my friends or with my family but mostly with my friends or a group of people that I enjoy and that’s where the emotion ties in for me. When I think back to things that I’ve done, actively engaged in the community, I’m thinking, oh I remember that, that was fun. We got to go do this thing that we’d have no other reason to do, I wouldn’t have made candy cane mice for any other reason. And it’s been a chance to be creative or to be outdoors or to meet people we didn’t know already. So for me it was the chance to do something different and fun with other people in a way that would have a fun experience. I also think that I never had kind of that mindset that more of a charity mindset of there’s people out there who need me, there’s people out there who are lacking or there’s people out there that have problems that I am here to come fix. And I haven’t been kind of conscious about that that I don’t think that service and doing good is always about finding others in need and filling those needs. I like the way of thinking about service and doing good as creating stronger communities with other people or doing things that benefit other people including yourself. Because they’re fun or because they’re a good idea or because they’re going to make everybody better and not necessarily that they’re going to — that they’re someone hurting or lacking or who has a problem and you are going to go there and fix it. Gina: Right. Is there anybody that you are still in connection with from Brownies years? Sharon: There’s a lot of people in my life who I’ve known from almost my whole life and I do seem to have relationships that last a really long time. I’m not sure why that is but that is something that I think is pretty unique that I have these three core friends that I’ve had since I was less than 5 and then just relationships with family, I’ve been with my husband for 15 years. I was saying something about scouts at my husband’s office party the other day or office barbecue. Well I don’t know. Casual thing. Gina: Office thing. Casual office gathering. Sharon: Hanging around, drinking beer at the office after hours. And I was explaining I was going to volunteer the next morning at a Girl Scouts thing. And I was getting really excited about it, I was kind of geeking out and trying to explain to these young men in their 20’s who are mostly concerned with beer and what mountain bike ride they’re going to do the next day like why I was getting up really early on a Saturday to go volunteer with the Girl Scouts and how this was something that I was proud to be a part of. And I realized in that moment and I don’t know why it took me that long to realize it but I realized it right then that I am a scouting nerd. Well I had just had the word nerd defined for me in some book I was reading and the person was explaining about how it’s something that you know way more about than most average and that you have spent more of your life doing it than most average people and that you can just really nerd out about it. You can talk about all the intricacies and you can get really excited about the smallest details about this particular topic and you’re just really into that topic. And I thought, “Oh I’m that way with service. I am a total service nerd”, and it probably started as a scouting nerd. So yeah. Gina: That is really cool. And the funny thing on my side is that actually about an emotional reaction from me, and it’s like I could feel myself starting to get teary. I’m like wow that’s really interesting and a piece of it is that I’m jealous. I was like, oh wow, that’s really cool to think about being a service nerd. And like you said those intricacies of what does that mean and how does that interconnect and that’s really cool. I am, I’m amazed. Sharon: And I think part of what I wanted from this podcast was sort of like a bat call to go out to the other service nerds that are out there because like any nerd population I think the internet has done great things for bringing nerds together around specific topics that are a bit niche and a bit– there aren’t necessarily people you meet every day who share that nerdy passion that you have. And so this podcast has been my chance to just really nerd out about service and like put it out there on the internet that loud and proud this is what I like to nerd out about and I’m trying to find the other people out there wherever they might be around the world who can just want to talk about this more and think about it and ask hard questions about it and tell stories about it and yeah. Sharon: Maybe we’ll eventually have something like ComicCon for service nerds. Gina: Oh, my gosh. Yes. Okay you heard it here first. This idea we will make it happen. That would be really cool. Sharon: I mean it kind of already exists, if you don’t know there’s a national conference on volunteering and service which happens every year in June and I am kind of still a little sad because I’m not signed up to go to it right now, and I’ve been to it several years. And this year it’s in Atlanta in June and I still might need to make it happen. I put it on the application to speak at it and I didn’t get accepted as a speaker but I may just have to go anyway. Because it is, it’s kind of like the ComicCon of service world. Gina: That’s really cool. I did not know about it at all. Sharon: Yeah. You feel — just like I’m sure people feel at something like comic con, you feel like these are my people, they get me and that it’s being celebrated. That thinking about service, that devoting your life to service, geeking out about it in every way, shape or form is totally celebrated in event like that. Season 2 of Do Good, Be Good is sponsored by my AmeriCorps webinar series. I offer live webinars for AmeriCorps supervisors and AmeriCorps members. One supervisor at my recent is member stress, stressing you out webinar said that it was the best webinar she has ever attended on any topic. Do you work in AmeriCorps program? Contact me at connect@sharonspeaks.com for more information. That’s connect@sharonspeaks.com. Mention this podcast for a 20% discount. Now, back to our show. Sharon: My first formal role in my career in service was as an AmeriCorps member. When I moved to Flagstaff in 2006 I actually moved here without a job, I don’t think I had a place to live. I was following a boy basically. Luckily that boy is now my husband and it was a good choice. But at the time I was taking a big risk, I was moving all the way from Washington DC area in Virginia out here to Flagstaff to live near him and luckily I got some good advice that I should consider taking an AmeriCorps position. And I did, I joined AmeriCorps and I was placed in a position where I was the Volunteer Coordinator for Coconino County Senior Services. And it was my role, it was actually a brand new role, something that I just started to place volunteers from the community to visit home-bound seniors and disabled adults. It’s basically like a dating service, but for seniors and disabled adults and matched with any age of person in the community. And I loved it, it was fantastic. One thing that I recognize now that I probably didn’t recognize then was that there — it’s hard not to sometimes judge people especially when you have this intimate relationship with them. So in order to match these seniors with volunteers, I would go in to where they were living, I would sit down I’d have an hour long interview with them. I’d sit on their couch and talk to them about their lives and I’d get to know them very well and I’d see them in their space, in their house. And so sometimes you would you think, huh I wonder why this person doesn’t have more family close to them or why they don’t have friends that could help more– these people are very isolated, very lonely. In some cases they just live very long lives and had basically outlived a lot of the resources in their lives of the relationships they had built. But in other cases, maybe they had made choices that had isolated them or had put them in opposition to people they loved or other things. So it was hard sometimes to not make a judgment call there and think, we’re going to help this person because they made bad choices. Yeah and I think when I was in AmeriCorps I was also exposed to an idea that I got really excited about and that I’ve kind of pursued in different ways since then, which was the idea and Martin Luther King Jr. has a quote about, anybody can be great because anybody can serve. And so really thinking about that in terms of what does it mean to help others and is it more helpful to engage people in being the helpers, so that they can feel empowered and feel ownership over their own community. I don’t exactly remember how I was exposed to this, but I know we did things about Martin Luther King Jr. day, I think we thought big thoughts around the national conference and service and volunteerism. So probably in one of those settings I was challenged with that thought. One way that I got to test that which is one of my still favorite projects I ever did as an AmeriCorps member was that I was there working with the seniors and because I was with the county, I got to meet– we would regularly meet with some of the other people who did things related to volunteerism at the county. So one of those women that I met, she was working with juvenile detainees and juveniles who had been the court system. So mostly I was helping her brainstorm projects that the young people who needed to do community service hours in the community could do. But we got to talking about the fact that she had her criminal offenders who were actually in custody who were young I mean some as young as maybe even 12 and 13. So she’s got these young people who are often detained for quite a long period of time and there’s not a lot for them to do. And if you can imagine that I mean, you can imagine I know you’ve experienced trying to keep young people engaged for even a snow day, now you’ve got young people who are detained with lots of limitations on what you can do with them. It’s not a healthy way for young people to be, I mean you can see that they would just get more detached, more depressed or more lonely feeling like they don’t have a future or they’re not valued or there is nothing for them to be, or to do. So we’re kind of brainstorming how could we engage them in some way and with those concept that people actually feel good when they can do good for other people or they feel more connected to the community. But it was hard because they’re literally behind bars and they’re not allowed to have very many things in there and people aren’t always allowed to go in there. So really was a good thought exercise of how do you do service work with people, young people who are detained. So I finally came up with this really cool idea which was– she was allowed to do craft projects with them. So we thought okay, we’re going to have them, it was right around Valentines Day. So we’re going to have them go old school, re embrace their kindergarten roots, do simple Valentines Day cards. Just only safety scissors and crayons and glue sticks and colored paper and they were going make these Valentines Day cards. And then each Valentines Day card was going to be placed on the tray for seniors who were part of the Meals on Wheels program. And what I loved about this was that you were taking two groups of people who couldn’t be more different in many cases, but at the same time they were actually fighting the same challenge. They were fighting loneliness, they were fighting detachment from their community, they felt forgotten by people. So you’ve got these seniors who are often disabled, home-bound, they are part of why Meals on Wheels exist is not just to bring them healthy food, but it’s to have a human being, open the door and hand it to them, so that they at least have interaction with one other human that day. And I learned by being part of that program how common that is for a lot of these home-bound elderly people in our community to be completely isolated, other than that one person delivering a tray of food. So we thought wouldn’t this be fun if we could have these Valentines Day cards that would show up as a surprise on Valentines Day on the trays of these seniors. And it worked, it was fantastic the kids loved it, they kept asking the coordinator, really we get to do this, we can make cards and yeah they got to be part of it, they really took to it they spent a lot of time with the cards they made them look nice. We were joking because she only had to pull, she did read all the cards and she only had to pull like 2 or 3 that had some offensive joke in there. But otherwise it was fine, they did a great job, they really took it to heart and some of them got a little emotional making the cards and then we heard great things from the seniors who have really enjoying getting those cards. And I know that I made the staff in our office cry when they saw the cards and so I was going out. Gina: One final question for you. What do you think it means to be good? Sharon: After having hosted this podcast for over 15 episodes, I would have an answer to that and I don’t think I do have a good answer to that which is part of why I’m doing this podcast. However, I do believe that anyone can be great because anyone can serve in the words of Martin Luther King Jr. So I think being good is being of service to others and finding ways to be yourself through service. And tapping into your own unique ‘personhood’ and bringing that out in the ways that you try to contribute to your family and your community and your country. Thank you for listening to Do Good, Be Good. For show notes on all of our episodes, visit dogoodbegoodshow.com. And if you want some behind the scenes stories and insights, check out our show page on Facebook at facebook.com/dogoodbegoodshow. This podcast was produced with help from Sun Sounds of Arizona. Music in this episode is Bathed in Fine Dust by Andy G. Cohen released under creative commons attribution international license and discovered in the free music archive. Until next week, this is Sharon Tewksbury-Bloom signing off.